Here’s a #truthbomb for you. In order to get where you want to go in business (and in life), it will require a massive shift in your mindset. Why? Because the success you desire as an entrepreneur comes when you have the right mindset and consistently take massive, imperfect action. I am so passionate about my job because I know that you CAN do it. While the entrepreneur life can be hella challenging, there has never been a better (or easier) time to build a business than the online world today. The internet has obliterated all geographical boundaries. We can use email marketing to sell our programs to people around the world. We can work in our pjs on the couch and there are accessible, intuitive platforms for literally EVERYTHING we need to build a money-making machine of a health business. We can start free Facebook communities and grow massive followings! It’s not the tech that’s going to get in the way of you building the business of your dreams. It’s the fear, overwhelm, loneliness and frustration that can derail your plans… it’s the mind set monster that lives in your head. Well, after more than a decade of entrepreneur life, I have learned a LOT about what it takes to grow a successful business… while also feeling the way I WANT to feel along the way. It’s been a hell of a ride and since my mission is to empower as many of you as possible to build the life and business of your dreams, I have put together my Top 9 Success Strategies for Entrepreneurs and shared it all with you in today’s podcast episode! From the importance of staying irrationally optimistic to what business model you choose… we cover it all. 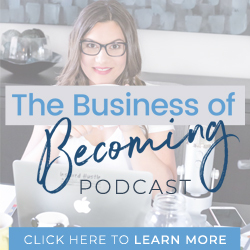 If you are a health coach, service provider, author, consultant, nutritionist, health professional or personal trainer and you want to have a bigger impact, uplevel your business (and your life) and actually ENJOY this business of becoming… this episode is for you! Which one of the 9 strategies really spoke to you? Which ones seems the most challenging? Pop it below or visit me on Instagram (my current social platform of choice) and send me a message there to let me know what you want to hear more about.